Can anyone tell me anything about Lewis Shaw of Baltimore? A family member told me the name and that he makes swords, but Google has only turned up references in other websites, and some poor quality pictures. I never heard of him before, but his interest in stage combat is talked about here. Fairly expensive, HATES sharp blades, prefers to work in steel for guards and plates. If he doesnt want to do a project he will let you know! Worth the money and worth the wait. Does wonderful fluted and twisted wire wrap handles over lexan that really take abuse. Expensive but really a must. When he attends shows (he is an SAFD cert teacher and attends/teaches at workshops) he is usually sold out before opening. Lewis Shaw makes some of the best handling stage combat weapons out there. They are the real Mercedes of the theatrical world. Another top notch cutler is Dennis Graves, of No Quarter Arms. They are both notoriously hard to buy from, since demand is so high and they both run small operations, but the quality is amazing. Compared to many stage weapons in the industry, they both make swords that are easy in the hand and have beautiful detail. 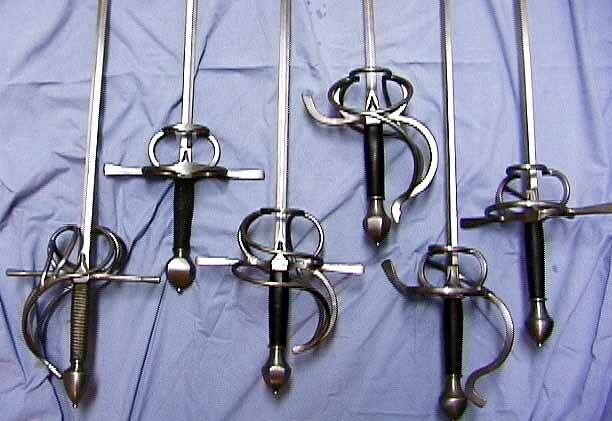 Here is a picture of some rapiers in the Atlanta Stage Combat Studio's inventory. I've used a number of Lewis Shaw pieces (including a few of these), but these are the only pics i've got on hand. He does work that ranges from diamond shlager bladed rapiers like these to full size rapiers and broadswords.